What can we learn from the response to the December 2015 floods in Cumbria? Severe rain storms in December 2015 and early 2016 caused significant damage and disruption to families and businesses in rural communities and larger towns and cities across the north of England and parts of Scotland. Record-breaking river levels over-topped flood defences, and caused flooding, damage to roads, bridges and widespread power failures. 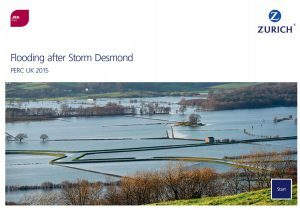 Working in partnership with the Zurich Insurance Group we have released a report detailing first hand experiences of flooding in Cumbria following Storm Desmond in December 2015. Our review of the response to flooding after Storm Desmond reports evidence from meetings and public exhibitions, led by the National Flood Forum, with residents and business owners from flooded communities across Cumbria. It highlights how resilience to flooding is something that takes sustained effort and that everyone may have a role to play. The flooding caused extensive damage to homes and businesses and created significant and ongoing distress and upheaval. There is some evidence that experience from previous flood events helped to improve the response this time. Local flood groups were established to provide help within the affected communities, whilst others already existed following flooding in recent years. There were also reports of insurance underwriters being on-site quickly to help clarify what assistance residents could expect. However, there was evidence of a lack of preparedness and resilience in other respects. Property Level Protection (PLP) has an important role to play but is just one tool in the range of options and is not a “fit and forget” solution. Individual and community emergency plans are essential component if property protection measures are to be well-maintained and their owners clear about the actions required to use them effectively. The experience after Storm Desmond reinforces the need for a blend of community-level measures such as flood defence schemes and warning systems, combined with individual measures such as individual property resilience, flood awareness, and adequate insurance. The review highlights how different levels of flood protection create differing levels of residual flood risk, which need to be better communicated and planned for. Many of these lessons chime with findings from other extreme weather events in the UK and elsewhere analysed using the same post event review capability (PERC) methodology developed as part of Zurich’s flood resilience alliance. One of the key recommendations is the need for better communication of hazard, risk and what actions to take when providing early warning services to communities. The review also identifies the need to apply and operationalise integrated flood risk management more effectively, and to share the responsibilities to protect communities and businesses in order to maximise protection levels, given the limited resources that are available. This report was produced as part of the JBA Trust’s programme of research to improve knowledge about flood risk and Zurich’s global flood resilience programme. We are grateful to Zurich for coordinating the study, and to JBA Consulting and JBA Risk Management for their support.